By now, we’ve debated the awesomeness vs. ridiculousness of last night’s Coachella set by Snoop Dogg and Dr. Dre, which featured a Star Warsy hologram-enabled appearance by the late Tupac Shakur — the stunt has spurred trending topics and (of course) a viral joke Twitter account with (as yet) 9,000 followers. The shocking from-the-grave performance, which actually was a twist on the speculations that sprang up last week that it would be Nate Dogg who’d be appearing via the wonders of technology, probably cost between $100,000 and $400,000, Nick Smith, the president of AV Concepts, estimated in an interview with MTV. Compared to what living, breathing Coachella headliners are paid — by 2012, likely in the seven-figure range for huge acts like Dre and Snoop — that’s not too much cash. In addition to ‘Pac’s pricetag, Smith also let fly a few more fun facts about the performance. We’ll probably never know just how much of those vocals on “Hail Mary” were actually Shakur’s or how exactly the hauntingly life-like production was synched up to Dre and Snoop’s live performance so perfectly (though Westword has a good explanation of the whole hologram operation and how it works). But we also got the ominous feeling that this kind of thing could very well be happening all over the place, and very soon, because even at $400,000, the production was cheap for what it means for live music: “If we had to bring entertainers around the world and create concerts across the country, we could put [artists] in every venue in the country,” Smith said, forecasting what could be the creepiest or coolest future ever. 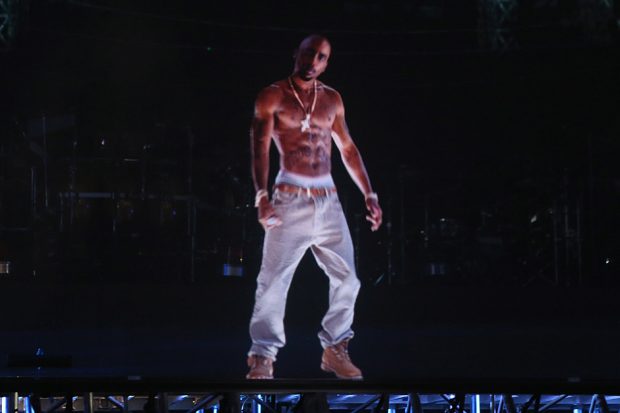 For now, we’ll just hope that Holo-Pac shows up to perform in the upcoming Tupac musical. Oh, and don’t worry, ‘Pac’s mom, turns out, was cool with the whole thing — especially since Dre reportedly donated a good chunk of cash to her late son’s memorial fund, the Tupac Amaru Shakur Foundation (TMZ). Watch the performance for the hundredth time today below, and try to shake the combination creeped-out/awestruck feeling once and for all.